To switch from one open window on your computer to another, hold down the Alt key (Command key for Mac), and click the Tab key. You’ll see all of your open windows pictured, and you can hit Tab (while continuing to hold down Alt or Command) until you get to the one you need. If you want to move backwards through the lineup of windows, use Alt-Shift-Tab (Command-Shift-Tab for Mac). It takes some time to get used to this shortcut, but once you do, it should save you a lot of time. Several of my clients were blown away by this little-known shortcut. 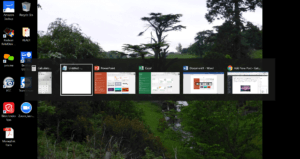 Bonus shortcut: To switch between open web browser tabs, hold down Control (Ctrl) + Tab while in a page of the browser. Like the other shortcut, you can move backwards using Control (Ctrl) + Shift + Tab. 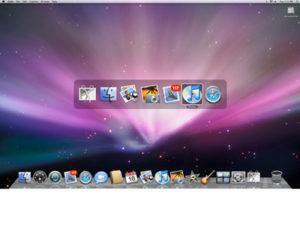 For Mac users, you will use Shift + Command + arrow key (left/right). 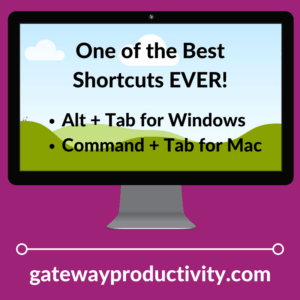 For more life-changing, or at least time-saving, shortcuts, see the links below.